Free Shipping Included! 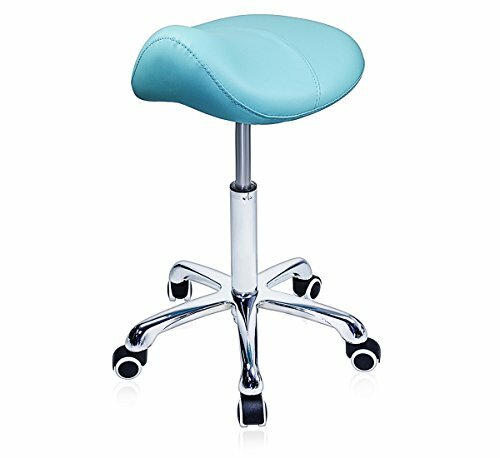 Grace & Grace Professional Saddle Stool Series Hydraulic Swivel Comfortable Ergonomic with Heavy Duty Metal Base for Clinic Dentist Spa Massage Salons Studio (Green) by Grace & Grace at My Natures Treasures. Hurry! Limited time offer. Offer valid only while supplies last. ENJOY YOUR SEAT, ENJOY YOUR WORK! Grace & Grace Rolling Stool Chair, the fantastic comfortable seat is designed to delight your rigorous daily work! ENJOY YOUR SEAT, ENJOY YOUR WORK! Grace & Grace Rolling Stool Chair, the fantastic comfortable seat is designed to delight your rigorous daily work! Guaranteed satisfaction, you may contact us and get FREE replacement if any quality problem within 1 year. Ergonomic designed to be used all day for better comfort, this saddle series keeps your body at the natural position, enables your weight to be more evenly distributed and helps you to ease the stress and pain on the back and spine.360-degree fully rotated seat with height adjustment and free rolling will help you to work, learn, and play more effectively. Superior parts and craftsmanship allows for daily usage of up to 400lbs of weight. High quality brand new foam, long-lasting PVC leather, heavy-duty iron frame base and premier casters makes it perfect for home and workplaces such as Massage, Salon, Spa,Clinic,Dental, Studio, etc. Grace & Grace is dedicated for years to provide professional solution for quality life, and we expect you have the most rewarding experience at purchasing and using our products. ** This chair is also available at BLACK and BLUE. Anti-exploding plate attached under the cushion guarantees the safety. Tool-free easy assembly according to the Instruction in the package and no tools needed. If any question for assembly or using our products, simply reach out to the Grace&Grace team and your satisfaction is guaranteed! If you have any questions about this product by Grace & Grace, contact us by completing and submitting the form below. If you are looking for a specif part number, please include it with your message.